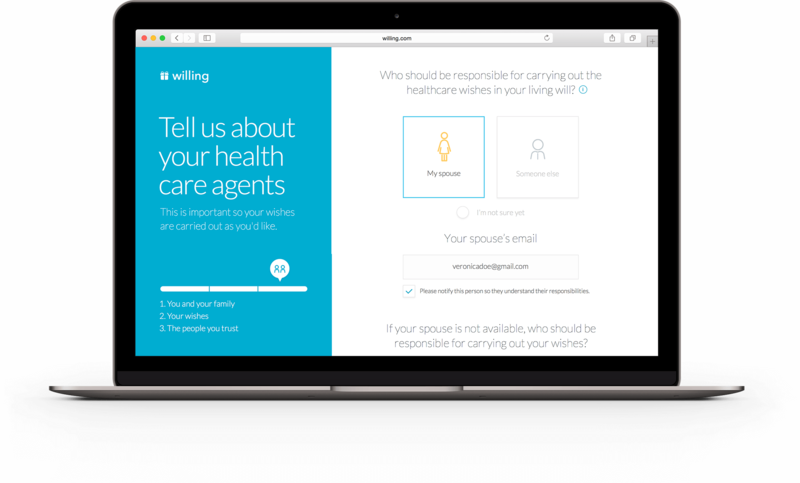 Willing is a start-up that offers consumers the opportunity to create a free legal will within 10 minutes. Their service is quick and easy and has a very high conversion rate. Nonetheless, they asked Doberman to improve their current service on user experience and design, because they felt that the interface lacked emotion and branding. We knew that the old wizard had a very high conversion rate. But there was still room for improvement. Based on user data we improved the flow of the wizard. The flow was simplified by bringing the wizard down from 5 to 3 steps. The user interface concept was also changed. To make the communication more clear and effective, the left side of the UI is used for communication towards the user (from Willing). The right side of the interface is where the will is being created (i.e. input from the user). Making your will is a serious job, but it doesn’t need to feel like a burden. We felt that the old wizard had a lot of unclear legal terms and serious language. The wizard is now more personal because we changed the copy to more human and understandable language. To improve the usability we clustered the most chosen answers, based on user data, and made the others secondary. By doing so we created a clear button hierarchy that helps the user to make quick but informed decisions. 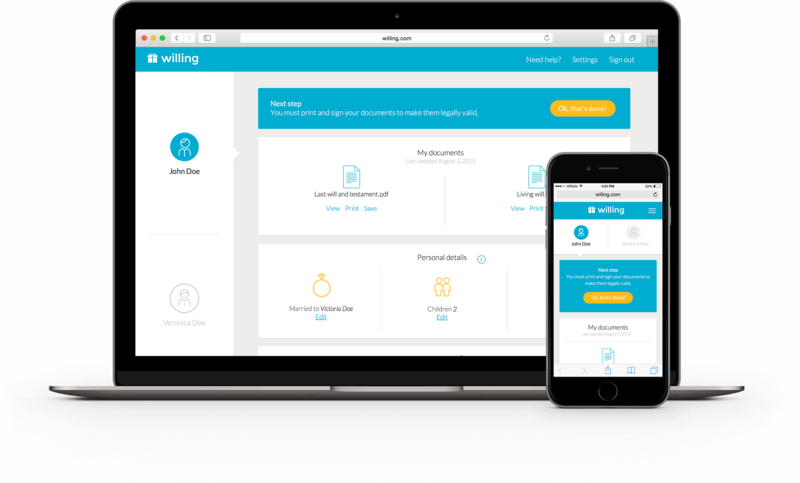 Next to that, we also polished the design to a more clean interface that fits the brand. The dashboard also uses a clear distinction between the users, where they can access their own documents. It’s also possible for a user to update their legal will, by simply clicking on the ‘edit’ button on the dashboard. 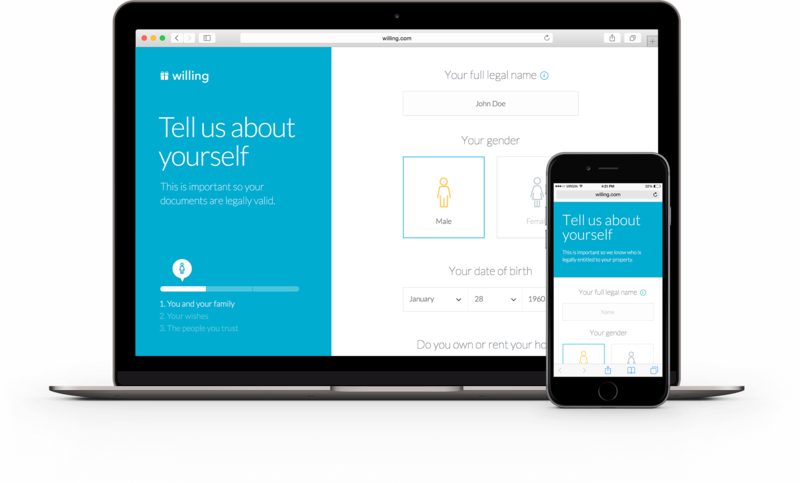 This will take the user to that specific step in the wizard so they can easily update their own will.